Fr. M.G. Victor:- This new priest has enjoyed all kinds of luxuries in the name of cases. He joined hands with the bishop and the former superintendent of RC Schools. He knew nothing about the school administration. But the Bishop gave a chance to this priest to enjoy his life with luxuries (car, travels, luxury rooms etc.,) with the money he got from the poor teachers who gave him tribute every month in the name of service charges/donation/voluntary contribution. He acted like an innocent man hiding his venomous qualities. He is a good example for a man of violence with a child’s face. He gave a lot of papers to the court unnecessarily. A Guru other than the Bishop for him is Mr. Xavier. He is far from justice. He could not continue in the post and went away. Perhaps to spoil another office!!! Fr. 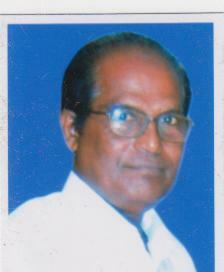 Panneer Selvam:- He was Superintendent of R.C. Schools in Tuticorin for some years. He has gone to the extent of saying that no one in the world could question their right. He has also told that even the goverment could not interfere wtih their administration. In his period he published a magazine called “Kalvi Seidi”. In it he boldly printed that the teachers who go on medical leave have to pay some money to the correspondents to get the leave sanctioned. He fixed amount also. He is still arguing that the illegal deduction from teachers is just and not against the rules. Even after reading the court order he says like this. He has gone above the court orders. Fr. Xavier Arul Raj:- He was the correspondent of St. Mary’s Higher Secondary School, Pothakalanvilai. He is the man of anger, pride and vanity. He is the root cause for the problems in in Tuticorin Diocese. He neither respects the teachers nor does he respect the rules and regulations of the government. He involved in all kinds of illegalities when he was correspondent. He would not sanction casual leave to the teachers. He was so cruel towards the teachers. One of the examples for his cruelty is that he put absent for a teacher who had sent telegram requesting two days of casual leave. He also went to the extent of deducting salary for those two days. He was so jealous that he could not tolerate a situation in which teachers sit on the chairs. His only enjoyment during his tenure as correspondent of schools was giving troubles to the teachers in the name of Minority Right. He treated the teachers like slaves. He is still a sadist. He was sent to Salaikudi Divine Centre. Even then there was no change in his behaviour. Now he is living near Tuticorin. It is funny that he goes to villages to give retreat to the teachers without shame!! He must understand that he is not eligible to give retreat – especially to the teachers. We have a number of documents for his follies and cruelty. Fr. Barnabas:- He is now Vicar Forane of Satankulam. He is totally ignorant of rules and regulations of education department. His past history tells that he follows the principle of divide and rule policy in all the parishes. The Manager Bp. Yvon Ambrose has elevated him without knowing his bad qualities. If any one asks about his illegalities, he will become furious. In the matter of regularization of teachers’ services he makes wrong representation and he purposely makes delay in getting approvals. He gives false representations to the department. He pretends to be just. But there is no connection between him and justice. The public is wondering how he studied B.Ed degree course!!! He wants others to be perfect. But he does not want to be perfect. He takes vengeance against the teachers. 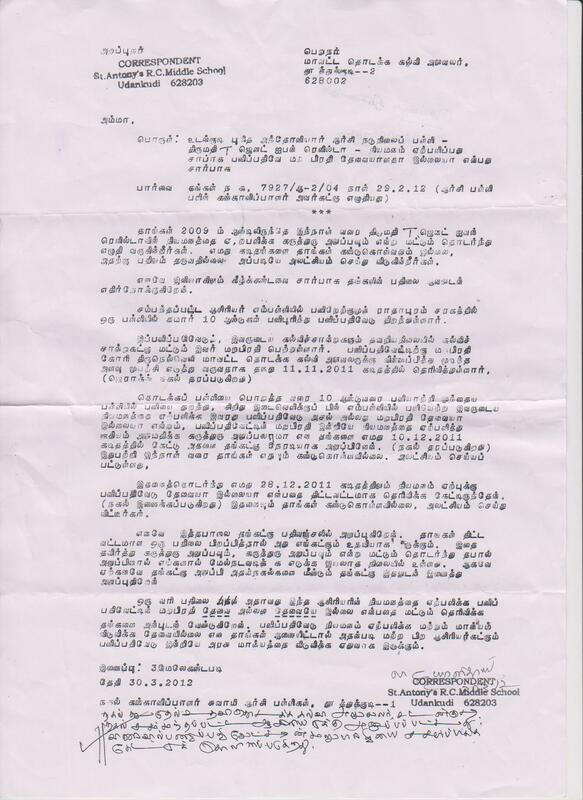 While there are eligible candidates for the post of HM in St. Joseph’s Girls Higher Secondary School, Satankulam, he has brought a candidate for this post from other district and other management without minding the court orders, rules and regulations of the education department and especially rule 15(4) of the Tamilnadu Private School Regulation Act 1974. He acts as though he is above the Manager of R.C. Schools, Tuticorin. He never mind about the instructions of the Manager too. Fr. 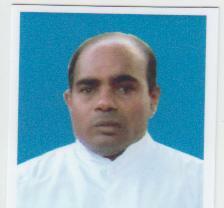 Dominic Arul Valan:- This priest has been promoted as Superintendent of RC Schools for the whole diocesan management. We already published that he would be promoted to the post of Superintendent of RC Schools for the whole diocese. The Bishop Yvon Ambroise is very clever in keeping this kind of priests who can give money to him. This priest is from a special background. No other priests respects him. Even the teachers do not respect him. They pretend to be respecting him because of the power he holds. Since he has a lot of money, he is jumping from heaven to hell. He has a car. He can go anywhere. He can stay anywhere in the name of office-work. He can get any amount of money from the teachers. He is now acting like a King. He is threatening the teachers with the tool of transfer and memos. He has gone to the extent of telling everybody that he managed to get a stay order in the Supreme Court against Mr. S. Peter Raj. Unfortunately, in this case, he does not know the difference between stay order and final order. It may take time to get justice. But justice will be proclaimed and it is not changed. He must know that it is a matter of delay only. He and the Manager think that the teachers are afraid of them. It is a wrong notion!!!. Teachers know that they are swindling money from them by threats. It is nothing but decent begging. We know the name of persons who beg. The teachers are waiting for a right time to go against the illegalities of these people. They cannot escape from them. Even for going against the teachers Fr. Dominic Arul Valan spends the money collected from teachers illegally. He thinks that he can send any kind of memos and other disturbing orders to the teachers. It is a pity that he gets money from teachers and he disturbs the same teachers. Is it not a shame to this priest to spend the teachers’ money for his own luxuries!!!?. Even the diesel he pours in his car is from the teachers’ money. He has not brought this money from his family. Public thinks that he buys illegal orders using the money collected illegally. A beggar who gets a one-rupee coin from a man is very grateful to the giver. He salutes the giver with respect and gratitude. Teachers are giving a lot of money to this priest for his luxuries. They are givers. How many salutes he owes to the teachers, the givers???? Even the food he eats in the hotels are from the teachers’ money!!! He is crushing the teachers under his feet. Is it not cruel to crush the givers with power and money? Is it Christianity? Did he get priestly ordination for involving in illegalities? – for telling lies? for stealing money from the poor teachers? For cheating the people? Where is the oath he undertook during ordination? – Chastity, poverty and obedience? Teachers think that he need not have a luxury car for his work (His work is worshiping the Bishop and stealing money from the teachers directly and indirectly). For this shameful work he is using a luxury car. Teachers cannot digest this. He can go to schools by bicycle or motor bike, if at all it is needed. If he is a good human being, he will change himself. Fr. Edward:- If any one wants to meet a school correspondent who knows nothing about the schools and rules about the school administration, he/she can go to Satankulam and meet Fr. Edward. This priest was actually sent away from Sokkankudieruppu by the village people. He did not know where to go. By that time the Bishop Yvon Ambroise gave him the post of Correspondent of some schools in and around Satankulam. He became one of the advisors for the Bishop Yvon who also knows nothing about school administration. After becoming correspondent of a few schools this priest was very happy. As he is also priest he enjoys a lot of privileges and respect. He is totally not eligible to be a correspondent of schools. He is totally inefficient. The following points are important to know about him. 1) He always pretends to be loving and innocent. 2) He attracts people by his pretending behaviour. 3) In reality he is far away from justice and love. 4) He is mad after money. 5) He can very well instigate others to quarrel. 6) He would take revenge and would look like a very meek person. 7) He would earn the concern of others by telling that he is sick. He is also very close to another priest namely Barnabas who can tell lies very fluently. He went to the extent of giving in writing that there was no eligible Teacher for the post of HM in St. Joseph’s Girls Higher Secondary School, Satankulam, to get approval for Sr. Antony Gerard, imported from another management from another district. He went to the extent of appointing a teacher in the deployed place by telling lies. Now this Priest Edward, joining hands with Priest Barnabas, is sending wrong proposals to the education department to get approvals. God alone can save the teachers from the cruel hands of such priests.